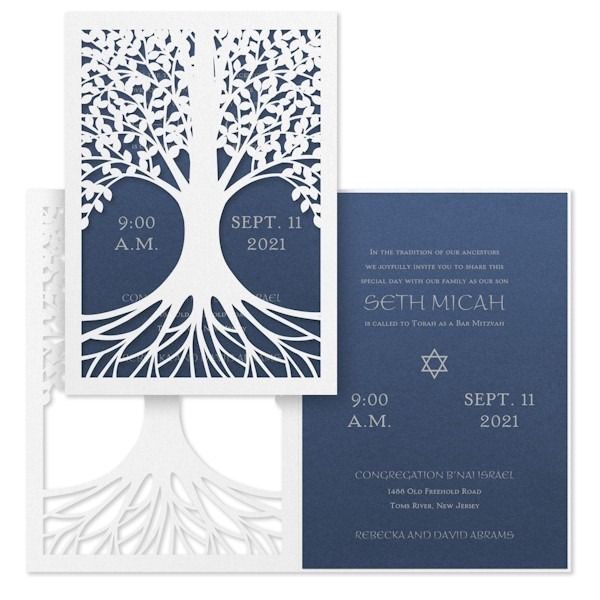 This exceptional Bar Mitzvah invitation is printed on Sapphire Shimmer card stock that gets mounted inside a White Shimmer folder which has been laser die-cut into a tree of life design. Your wording details will be arranged as shown. This exceptional Bar Mitzvah invitation is printed on Sapphire Shimmer card stock that gets mounted inside a White Shimmer folder which has been laser die-cut into a tree of life design. Your wording details will be arranged as shown. Measures 5-1/8″ wide by 7-1/4″ high. Shown with flat silver ink and combination lettering styles HLO/BRA. The reception and response enclosures will print on White Shimmer single card stock. This Bar Mitzvah invitation is accompanied by single bright white envelopes. Customer assembly is required.